Come evening and there is a Mela on certain city roads with vendors turning out in large numbers to sell everything from momos to gobi manchurian, egg, vegetarian and meat rolls to dosas, cut fruits, salted-and-peppered raw mangoes and pani-puris from their pushcarts. With people, especially youngsters and job-goers, flocking to them in hordes, the roads provide a carnival-like atmosphere for a few hours. But the morning after is not so pretty as garbage is strewn all over the roads and pavements, leaving the area in a mess and making it a gargantuan task for Pourakarmikas to clean. 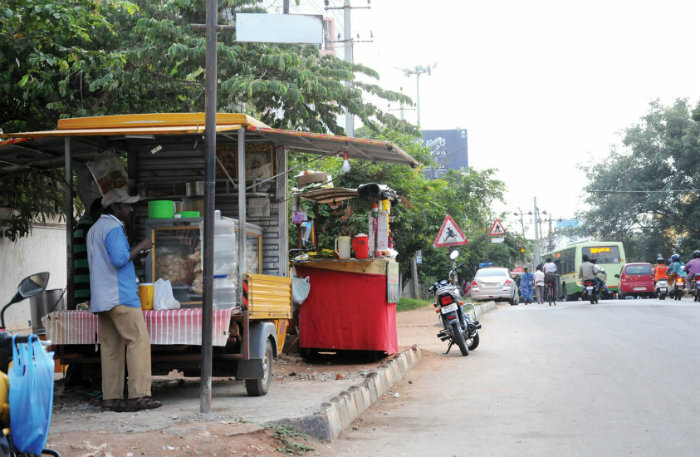 Star of Mysore goes around the city to feature some of these FOOTPATHS that have turned into FOODPATHS. Take a look in this Weekend Star Supplement. 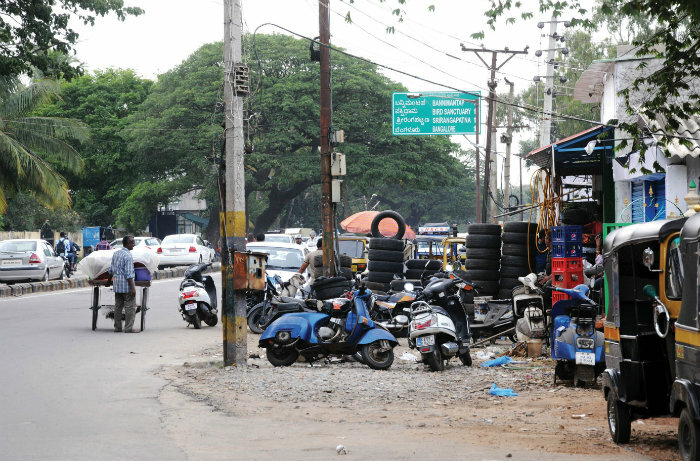 Have you ever noticed an unoccupied footpath in Mysuru? Does it even exist? And if it does, does it have space for pedestrians to walk without fear of being run over, pushed around by vendors or without breaking a limb or two? Vendors rule the streets, transforming main thoroughfares into street food hubs, leaving behind mounds of garbage and blocking free movement of pedestrians and traffic. Pavements that are reserved for pedestrians have been usurped. 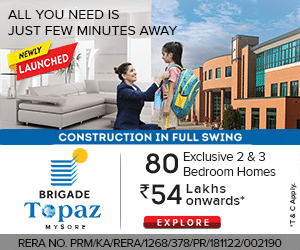 Be it the Sayyaji Rao Road, Raja Marga from the Mysore Palace to Bannimantap and even its extension till LIC Circle or footpath near T.K. 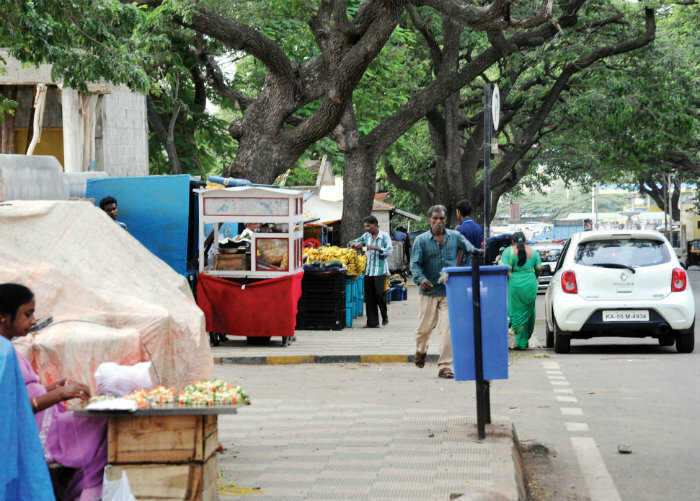 Layout – almost all the footpaths have been occupied. Pavements have become an extension of commercial establishments where platforms have been erected to serve as kitchens for eateries. The rights of pedestrian are ignored in every possible way. So much so that concrete structures have been built on footpaths and hotels and restaurants also use the footpath as an area to wash vessels and as a garbage transit point. The ever-busy Raja Marga starting from the Mysore Palace is dotted with many footpath vendors. This is one such place in the city where pedestrians are forced to walk on streets, risking their lives. Vendors put up their stall every day at around 4 pm and operate till late in the night. 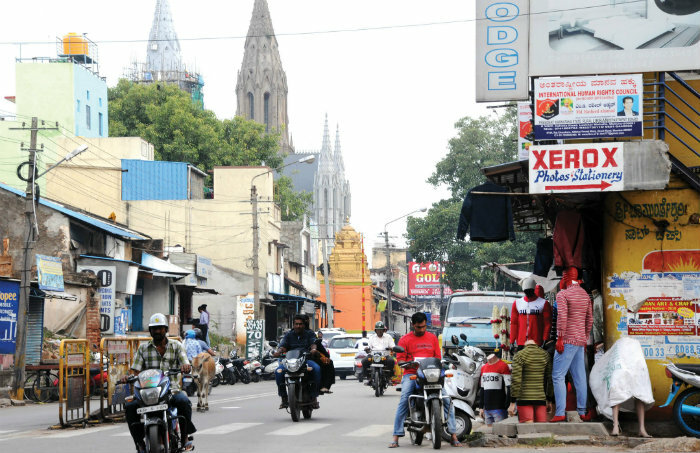 This extended Sayyaji Rao Road is otherwise famous for the concrete spectator gallery that hosts thousands of people during the Vijayadashami procession on the penultimate day of Dasara. 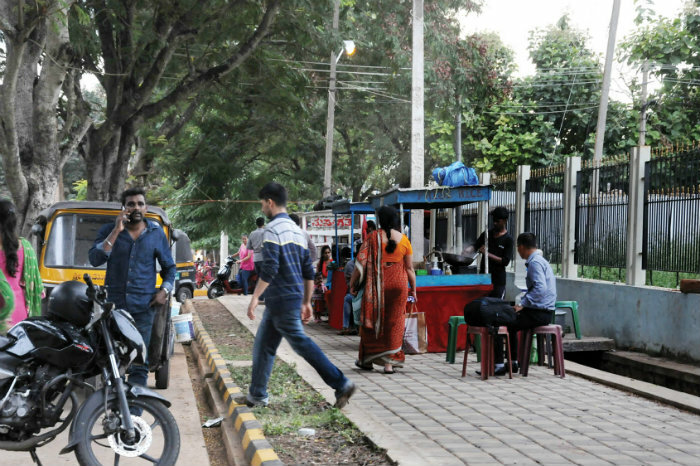 Rest of the months, the wide footpath space is used by vendors to sell food that ranges from pani-puris, Tirunelveli Halwas, gobi manchurian, fried rice, kebabs and even fried rice. These joints are famous as a lot of truck and auto drivers and mechanics come here to have a grub during nights after a hard day’s work. How about some fruits after a Biriyani? Many people frequent this stretch that leads from Highway Circle (Elephant Circle or Maulana Abul Kalam Azad Circle) to the LIC Circle. As a KSRTC depot is located here, workers come on to the road to have biriyani and other food items including the traditional Ragi Mudde and Uppu-Saaru. A billion dollar question: Where is the footpath here? 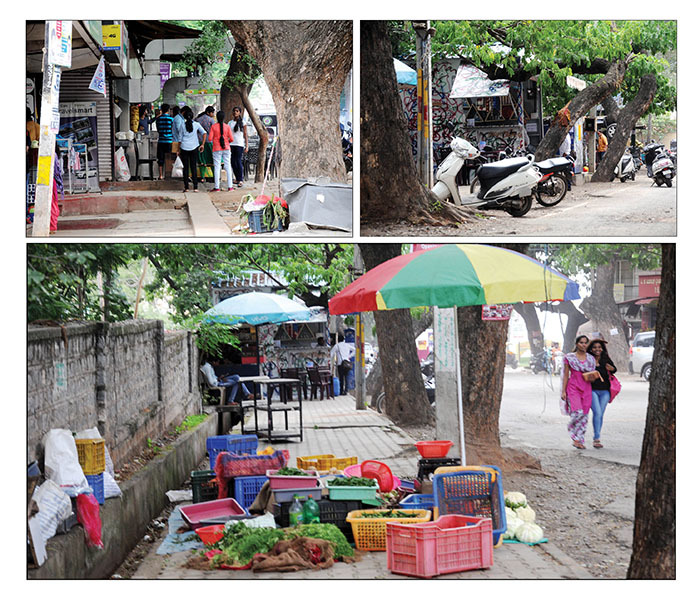 It is an apology of a footpath at Tipu Circle near Millennium Circle where workshops and garages have encroached upon footpaths, leaving little space for pedestrians to walk. Amidst the garages are small eateries that offer the much-needed food and tea breaks for mechanics who are usually draped in oil and greased clothes. 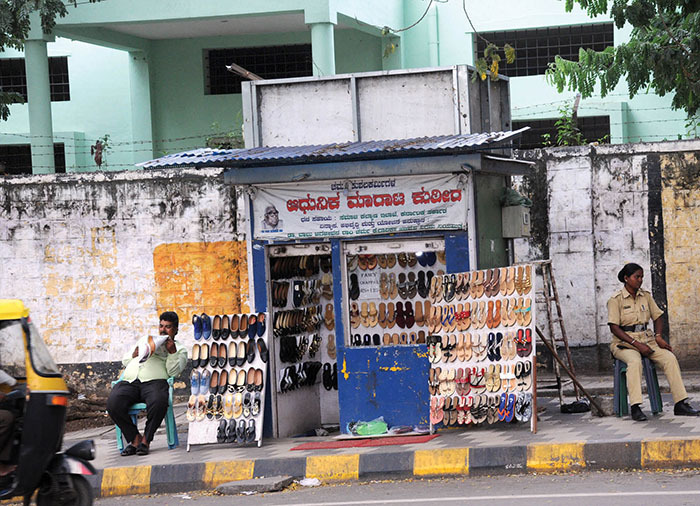 The busy area of Bannimantap where footpaths have been occupied by shops and other business establishments. While on one side of the footpath has been occupied by concrete structures, the other side is used by hotels to extend their food counters. Some enterprising hotels here even offer “open-air eating experience” for guests on the footpaths. 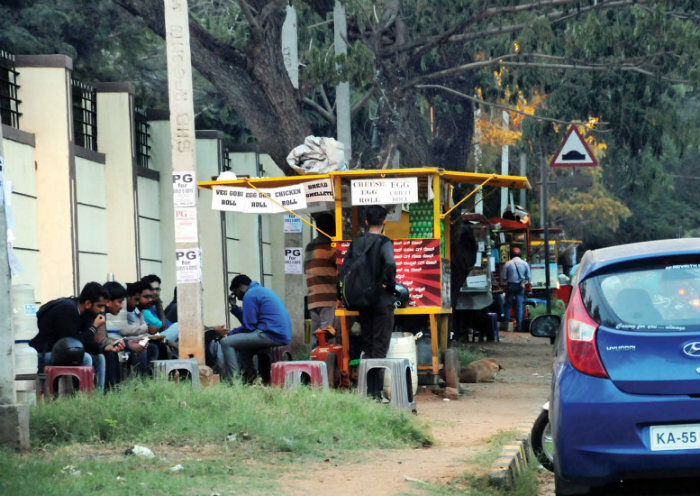 The area is dominated by student population who are not complaining as they quietly leave the footpaths and walk on the roads, jostling for space with vehicles. This is the road that houses the Mysore Central Jail where hundreds of people come on a day-to-day basis to meet relatives who are behind bars. While one side of the road is occupied by fruit and flower vendors, the other side are petty shops selling all kinds of wares from slippers to milk products. Ironically Policemen too occupy the space to catch up with some rest. This is a wide road that leads from Bake Point Junction to T.K. Layout near Kuduremaala Road or Manasa Road. You will get everything here — from fried rice to pani-puris, gobi, dry gobi and even sandwiches. Pedestrians and vendors here co-exist with the former visiting the stalls to have a bite or two after college or office. During nights, the pushcarts are brightly lit to attract home-goers who are lazy to cook and can make good with a plate of gobi manchurian or a masala-puri. 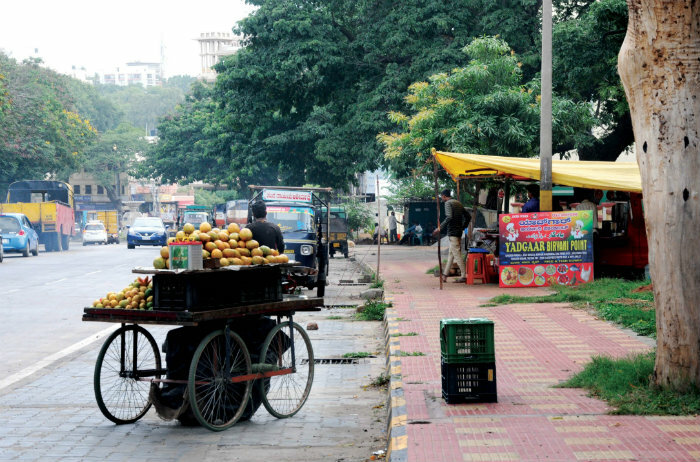 Vegetable vendors sell their produce on the Kuduremaala Road or Manasa Road. Come rain or shine, the vendors are always here. The MCC is building permanent structures for the vendors opposite the present space. Once completed, the vendors will shift. At present, it is risky for them to sell vegetables here as there is a risk of rain and tree branches falling on their make-shift tents. This particular place near Maruti Temple at T.K. Layout is a hub of activity after 6 pm. While one can find pushcarts that sell fried eggs and pakodas, just besides this shop a man sells tender coconuts1 attracts eaters and night-flies at the same time! Vendors here do roaring business till about 10 pm and their daily earnings touch Rs. 4,000 to Rs. 5,000. 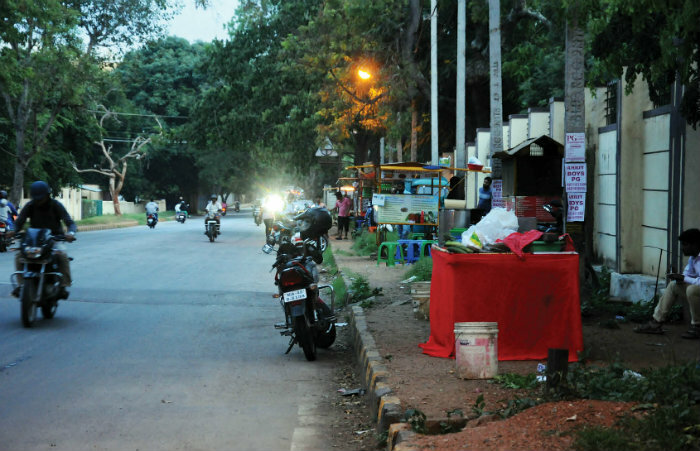 This road houses the Sri Jayachamarajendra College of Engineering, All India Institute of Speech and Hearing, Regional Institute of Engineering and the Demonstration School. 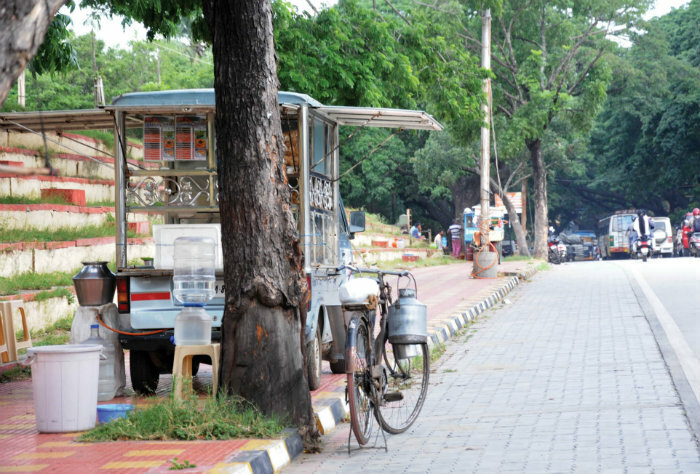 As it is a hub of education with Manasagangothri campus close by, the road is a favourite hangout for students. 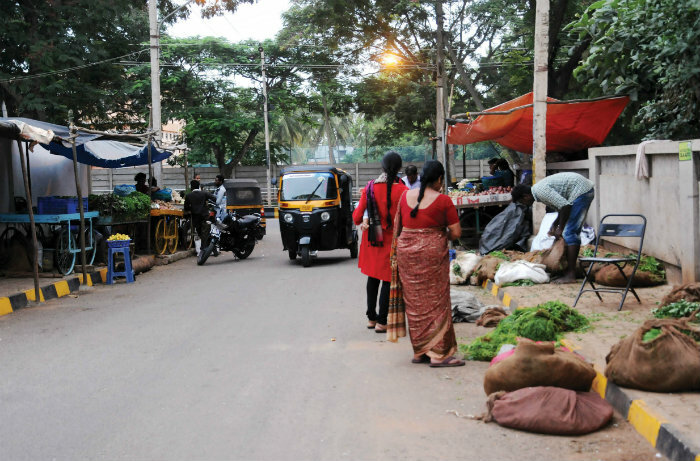 Come evening, the road comes alive with brightly-lit push carts, autos that have been converted into make-shift stalls. From egg rolls to chicken rolls, omelettes to churumuri, fruit salad to ice-cream, students have a wide variety to taste. 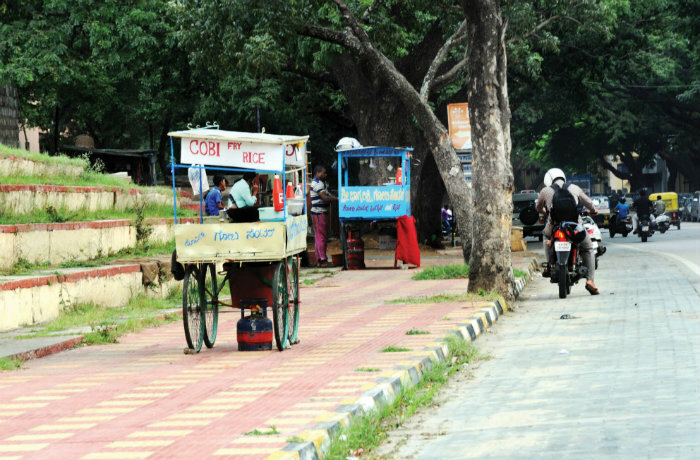 While the footpaths are covered by these pushcarts, they make enough space for students to sit and chat while enjoying hot snacks straight from the pan to plate. 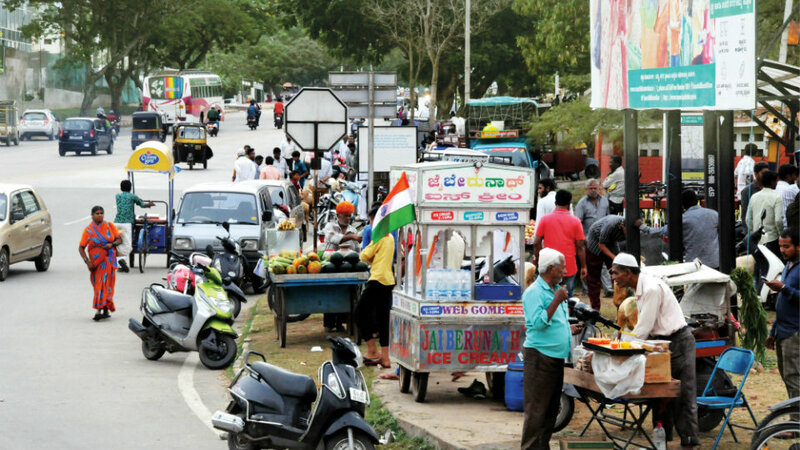 The Mysuru City Corporation (MCC) will soon shift street food vendors and hawkers to designated zones that have been planned across the city. Footpath vendors do not have permission from the MCC to run their business and what they are doing now is illegal, said MCC Commissioner K.H. Jagadeesha. “We have identified footpath food vendors and we will clear them in stages. We have rounded off 13 designated places for exclusive food zones. The food zone at Ballal Circle is ready to occupy. One more food zone will be set up at Kuvempunagar and the rest are in the pipeline. We will provide identity cards to the vendors and ask them to shift,” he said. “The MCC will provide facilities for food vendors like drinking water and for waste disposal. 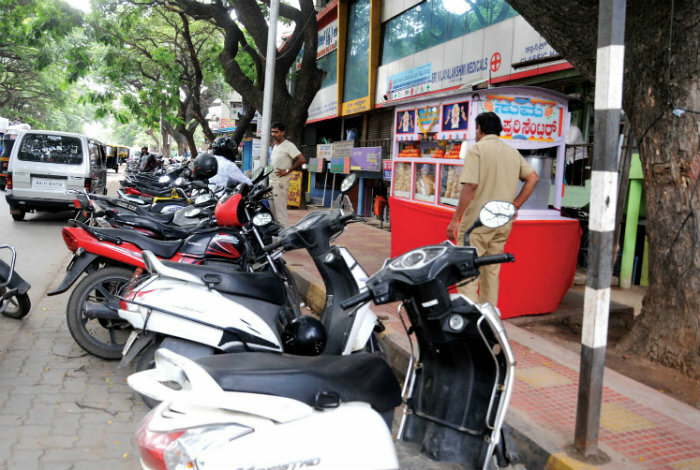 Once the food zones are set up, Mysuru will be free from footpath encroachment. The MCC has set the process in motion by establishing Town Vending Committee. The engineering section builds and designs the food zones and the zones are maintained by the MCC health department,” said MCC Additional Deputy Commissioner Ravindra. 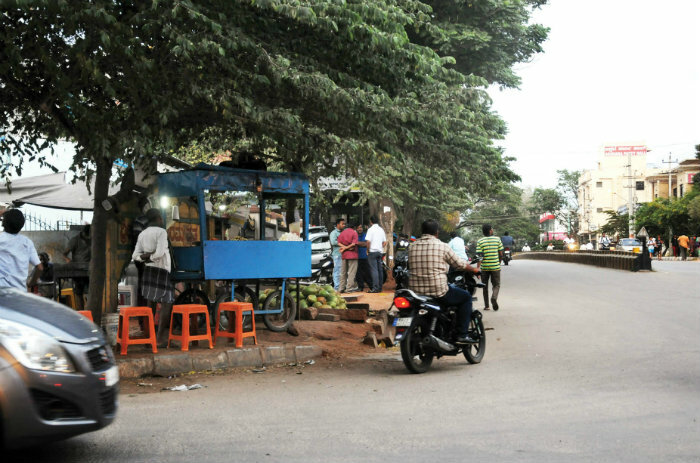 A very good article about the disappearing footpaths in Mysuru. The blame for this is shared equally by the citizens and the MCC. As long as customers are willing to patronize these footpath vendors, they have no incentive to move. The luminaries of the MCC are too busy playing politics to worry about trivial matters like these. The phenomenon of disappearing footpaths is not just confined to busy streets. In residential areas, homeowners brazenly incorporate the footpaths into their property. These are the educated elites of the society! The citizens of India are notorious for disobeying the rules and laws, this includes our ruling elites! Catching up with China? Not in your dreams! !